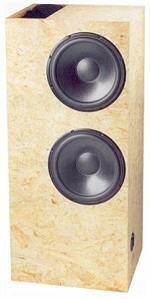 The CT 221 is a transmission line subwoofer containing a Peerless SLS-12. The Udo Wohlgemuth design has a triple folded transmission line where the driver was placed at 1/3 of the duct (CT 221: 1/3 and 1/5). The small CT 219, the medium sized CT 220 and the powerful CT 221 are forming a range of transmission line subwoofers with different outputs. Considering their size all subwoofers show an astonishingly low frequency response. Please note: the amplifier needs to be fitted into a separate casing, since there is not enough space due to the transmission line channel.